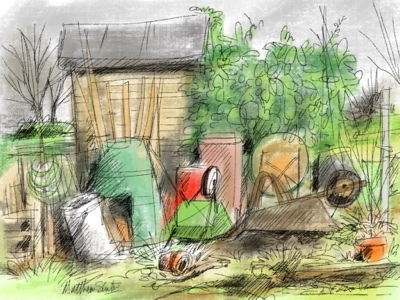 Whilst manning the shop on the allotment site I drew the view out of the window. This is very much a rushed scribble in-between serving a select few customers. Chilly, showery, sunny spells.... Ground very wet still and I don't think the gardening season has really started yet. Still rather wintery for mid-March.